Is the customer is always right? Not at this convenience store. One evening at the local Gas 'N' Goods station, employees Tom and Jennifer decide to make their jobs fun while dealing with a druggie boyfriend, an arrogant yuppie, their stressed-out manager, and the usual bizarre customers. Will they still have time to figure out how they really feel about each other? Crazy Edna and Karen watch as Officer O'Donahue hands Tom her card while Jennifer calls Buzz. "Do You Have Gas?" 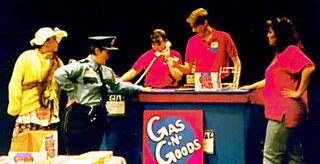 was originally produced by Theatre Unlimited on March 20, 21, 27, & 28, 1998 in the Bangsberg Black Box Theater at Bemidji State University in Bemidji, Minnesota. Jennifer sulks as a jealous Tom meets Buzz for the first time. 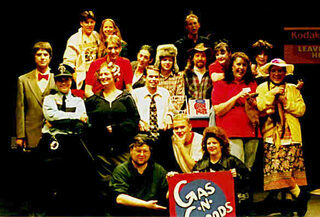 The cast and crew of "DoYou Have Gas?"